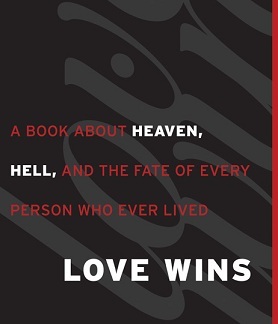 Review of “Love Wins” by Rob Bell: Preface and Chapter 1 | J.W. Wartick -"Always Have a Reason"
I know I am late to this party. It has taken me a while to get around to reading Love Wins by Rob Bell. There are many other looks at Love Wins available online, both critical and positive. What do I hope to offer here? I will analyze Rob Bell’s arguments in three primary ways: in light of historical theology, in light of methodology, and in light of analytic theology. I believe this will offer a thorough look at several of Bell’s claims. I hope to offer as even-handed an analysis as possible. Rob Bell’s argument will be examined for historical accuracy and philosophical rigor. Furthermore, I will examine how Rob Bell makes his argument, because method is often one of the primary ways that people err in their theology. I begin with an analysis of the Preface and Chapter 1. I am hoping to release one post a week as I analyze this text. I will post each section with an outline of the arguments followed by my analysis. Before I begin, one more note on this analysis: I have not read the book yet. My reason for this is I want to have it fresh in my mind as I do the analysis instead of coming to the text with a preconceived notion of what I remember it saying. Thus, these analyses will be based on a reading of the book chapter by chapter. I will end with an overall review once I wrap up the book. See the end of the post for links to other chapters. Rob Bell begins his book with a fairly simple statement “I believe that Jesus’s story is first and foremost about the love of God for every single one of us” (vii). Bell asserts that “Jesus’s story has been hijacked by a number of other stories… it’s time to reclaim it” (vii-viii). He points out that some teachings about Jesus have caused people to stumble, and that others do not discuss the issue of hell for various reasons. Bell is to be commended for taking on an issue that many are afraid to discuss. It is true that some people and even churches will not delve into the topic of hell. It is important to talk about this doctrine, as it has been part of Christian teaching from the beginning. Unfortunately, it seems that Bell has already made a methodological mistake. He implored readers to “please understand that nothing in this book hasn’t been taught, suggested, or celebrated by many before me. I haven’t come up with a radical new teaching… That’s the beauty of the historic, orthodox Christian faith. It’s a deep, wide, diverse stream that’s been flowing for thousands of years…” (x-xi). There are actually two errors here. First, simple diversity on a topic doesn’t somehow automatically validate all positions. Just because there was diversity about the doctrine of the Trinity doesn’t mean that the Arian position is somehow a valid theological perspective. Thus, it seems that Bell’s point here is moot. Diversity does not mean validity. Bell starts with a story about a quote from Gandhi, which prompted someone to write “Reality check: He’s in hell.” Bell reacts to this with a series of questions: “Really? Gandhi’s in hell? He is? We have confirmation of this? Somebody knows this? Without a doubt?” (1-2). Elsewhere, he focuses in on the individual again, asking whether it is true that the Christian message for someone who claimed to be an atheist during life has “no hope” (3). He goes on to ask: “Has God created millions of people over tens of thousands of years who are going to spend eternity in anguish? Can God do this, or even allow this, and still claim to be a loving God? Does God punish people for thousands of years with infinite, eternal torment for things they did in their few finite years of life?” (2). After focusing on the case of an individual’s salvation and whether there is an age of accountability, Bell focuses on the nature of salvation. “[W]hat exactly would have to happen… to change [an individual’s] future? Would he have had to perform a specific rite or ritual? Or take a class? Or be baptized? Or join a church? Or have something happen somewhere in his heart?” (5). Bell notes that some hold that one has to say a sinner’s prayer or pray in a specific way in order to get saved. Bell continues to contemplate what it is to be saved, and points out that some believe that it is about a “personal relationship” but that that phrase is never used in the Bible. He asks why, if it is so central to salvation, would such a phrase not be in the Bible? (10-11). Bell asks whether “going to heaven is dependent on something I do” and then asks “How is any of that grace?” (11). Then, Bell looks at various Biblical narratives, including the faith of the centurion, the discourse with Nicodemus, Paul’s conversion, and more, providing a constant stream of questions and noting apparently different things said about faith and salvation (12-18). Bell is right to focus on the notion of one’s personal fate. It is indeed impossible to declare with certainty that a specific person is in hell. It is always possible that God called them to faith in Christ before they died, even at the last moment. We should never say with 100% certainty that someone is in hell. Bell is also correct to raise doubts about various things that people allegedly need to do in order to “get saved.” His critique of such theologies is again based around questions instead of head-on arguments, but even that is enough to poke holes into works-based theologies. There seems to be a rather major methodological error in Bell’s analysis of a “personal relationship” with God.” His argument against using this notion to discuss salvation is to say that the phrase is not used in the Bible anywhere. As noted in the outline, he asks a number of very pointed questions regarding this and notes that the phrase isn’t in the Bible. But there are other phrases not used in the Bible which are central issues for Christianity, like “Trinity.” A phrase not appearing in the Bible does not automatically mean it isn’t taught by the Bible. Things can be derived from Biblical teaching without having the exact phrase we use to describe that teaching appear in the Bible. Just to hammer this home, let me point out that the phrase “Love Wins” nowhere appears in the Bible. One using Bell’s methodology here might come to the conclusion that his book is unbiblical. Just as an aside, I found it a bit of a methodological problem that Bell begins the book with a chapter that is almost entirely questions. He promises answers later, but for now it seems like all the reader is left with is a bunch of–make no mistake about it–leading questions. I think that leading questions are appropriate for teaching, but not so much for defense of a position. So far, we have seen that Bell makes a few methodological errors, each at a central part of his chapter. First, he made the assumption that diversity of views means validity of all. We have seen that such is not the case, diversity of views does not put them all on a level playing field. Second, he argued that because a phrase isn’t in the Bible, it doesn’t seem to be Biblical. We pointed out that this would collapse Bell’s own work because “love wins” is not found in the Bible. Even if it were, however, we noted that the mere absence of a phrase does not entail its falsehood or unbiblical nature. However, we have also had several good things to say about Love Wins. In particular, his analysis of works-based systems of salvation was helpful. The fact that Bell is willing to discuss a controversial topic and ask the hard questions is also commendable. Next week, we’ll analyze Chapter 2, which is about heaven. I look forward to your comments! First question: Why? What makes you think these are appropriate methods with which to examine this book? Having read it, and being familiar with all of these fields of study, I’m quite sure that Love Wins falls under none of them. If you’re looking for philosophical rigor or great emphasis on history or academic theology, you will be disappointed. The book is much closer to an extended poem than any of that. Second question: You talk much about ‘method’ and ‘methodology,’ but you aren’t very clear about what you mean by it, nor are you entirely clear about your own (though I can guess pretty well from the tone of your blog overall). And you don’t make any effort to lay out what Bell’s methodology might be. How, then, can you criticize it? The closest you come is in saying, “I will examine how Rob Bell makes his argument, because method is often one of the primary ways that people err in their theology.” But there’s much more to methodology than “how one makes an argument,” and it isn’t even clear yet that Bell is trying to make an argument; this has yet to be established, much less what sort of argument it might be if he is, and what its goals are. Also, even if you do the work and find out what Bell’s methodology is, and what yours is, and you compare them, on what basis could you then conclude that he is “erring in his theology”? Simply that your methodologies are different? Surely we need something more than that. Comment: You say, “First, simple diversity on a topic doesn’t somehow automatically validate all positions.” Great. Bell doesn’t say (or imply) that it does, not even in the bit you quoted. Other comment: You say, “…historic, orthodox faith is not a diverse array of beliefs. The historic Christian faith has been define [sic] in universally acknowledged creeds which state what the universal church teaches on various essentials for the Christian faith.” If the second sentence here is meant to support the first, it doesn’t. The reason is in the very word you choose to express what the creeds teach: essentials. Beyond these essentials (beginning with interpretations of those essentials), there is indeed a “diverse array of beliefs” and there always has been. Bell is merely noting this fact. And he is implying that the doctrine of hell is among the non-essentials. I believe that he is right about this, and history seems to be on his side as well (note that being very important to a lot of people for a long time does not make a doctrine ‘essential’). Lastly, your worries about the ‘personal relationship’ stuff seems rather unfair to me, and if my concerns expressed in my first two questions are on track, then your objection here will be moot anyway. I realize I haven’t been very complimentary in this comment; please don’t take that as being overly combative. It’s all meant in love–the sort of love that expects rigor from those who claim to value it. 🙂 Also, I’m rather a fan of this book, imperfect though it is, and I’m frustrated by the many mischaracterizations of it that I’ve seen. If I can help you avoid those errors, I’d like to. What Bell gets right is, in my opinion, far more important than anything he might get wrong, and the book has much potential to help heal a lot of people that have been hurt by some very bad theology. Please keep this in mind while critiquing it; you are not critiquing an article in some analytic journal that only a few professionals will ever read and that will never make any difference in anyone’s life. This book can and does make real differences to people, and some of those might be your readers. Are you suggesting that Bell makes no philosophical claims? Does he say nothing about historical theology? It seems to me that, so far, he has done both of these. Whether he is rigorous or not, that means his arguments are worth evaluating. Your critiques of my analysis of methodology are, I think, off base. He clearly uses specific methods when he makes certain arguments, and for example calling my “worries about the ‘personal relationship’ stuff… rather unfair” does little to alleviate my concern about how Bell argues against it. You provided no reason for me to think that it is unfair, you just said that it seems unfair to you. Could you show me why? It seems to me spot on: Bell’s argument against this was that the phrase was never used in the Bible. That’s it. I actually agree with Bell about the fact that this specific portrayal of salvation is wrong, but his argument against it could easily be turned against him. Where in the Bible does it say “love wins”? Bell’s method here is very problematic. Part of the problem with what Bell says about orthodoxy is the fact that he simply refuses to define it (so far in the book). I agree that he may be talking about something else, and I even noted that. It therefore seems to me your complaint is off the mark. I explicitly say that he may be using it in this other sense. Regarding your last paragraph: if this book “can and does make real differences to people…” then is it not important for it to get theology correct? Should we not expect Bell to avoid methodological blunders? If this book has such a major impact, should I not be concerned if it gets the issues it discusses wrong? And, as you may see in the next chapter’s analysis, it seems he gets some very important things very wrong. Your only real critique thus far, it seems, is the discussion of personal relationships. But the only reason you criticized it for this is because you thought it was unfair without any reason to think so. Furthermore, your last paragraph seems a broad appeal to emotion, saying that because the book helps people, it must be good. Well, the Book of Mormon also “helps people,” but I certainly don’t think it’s a good thing. First, my main (or ‘only real’) critique is not the personal relationship stuff. In fact, if you notice, it comes at the end of my comment and I call it “moot.” This is because it is contained within what actually is my main critique–which, oddly, you don’t address–which is that you have not established that you are justified in critiquing the book the way that you are. I’ll use what should be a familiar analogy from the world of biblical hermeneutics: as you know, the books of the Bible come in various genres, and there are general rules for how the books should be read and interpreted, which vary across the genres. We would (should) not read an epistle the same way we read a psalm, for example. My criticism of your post is simply that you are neglecting this fact with Love Wins. It is not a philosophical, theological, or even academic text. It is something else (I suggest it is more akin to inspirational prose-poetry). Thus, the methods used for reading and evaluating those other types of writing are of no special use here. Hopefully it is clear why the ‘personal relationship’ stuff is moot if I am right about this: your critique of his ‘argument’ (which you take to be something like, “The phrase never appears in the Bible; If it were true (or useful), it would be in the Bible; Therefore, the phrase is not true (or useful).”) is just irrelevant if we do not read the book as a standard, academic theology text. Obviously, the modus tollens I just constructed is problematic, but why should Bell care about that? He isn’t trying to construct sound arguments to convince people to stop saying “personal relationship.” Rather, he is (I think) trying to get them to ask why they say such things, and one of the best ways of doing this is to point out (in simple, common, poetic language) that that phrase does not appear in the text Christians (including those Christians who champion such language) claim to live by. Obviously, it doesn’t follow that it’s thereby false, but it does give one reason to wonder why it’s so prevalent. As I’m sure you’ve noticed, Bell is not very interested in providing answers in this book. He is interested in helping people to ask good questions (or if they’re new to questioning, even just getting them to ask questions is a start, whether they’re good questions or not). Thus, arguments intended to convince people of a particular position are contrary to the spirit of the book. What Bell wants is a dialogue, and that starts by questioning the status quo, which in this case happens to be the establishment view that upon death, people who aren’t ‘saved’ are going to spend eternity (conceived as an infinite length of time) in conscious torment, and further that this is the directive of the Christian God. Thus, your critiques of his ‘arguments’ are completely irrelevant. That’s not his goal. I wouldn’t even put it past him to make a bad argument intentionally just to get people talking about something (though I am not claiming he does this, only that it would be consistent with what seem to be his goals). Of course I’m not saying that. He says many things (e.g. the premise for the entire book) that are relevant to “historical theology” and that could be construed as involving “claims,” though I’m not sure how “philosophical” any of them are. We philosophers have a tendency to read everything like we’re reading Kant or something, expecting a tricky philosophical move around every corner. Sure, Bell makes claims, but I doubt they’re ever very philosophical, and most of the time I hesitate to even call them claims, since they are usually interrogative, and intended to open discussion rather than convince. And yes, you are right that if he indeed makes an argument, it is worth evaluating, but of course this should be done fairly, keeping in mind the genre of the text in which it appears, and what his intentions for the argument likely are. I’ve already responded to this above, but I’ll just reiterate that you are using the words “method” and “methodology” rather loosely, which is unfortunate as you seem to hang a lot on them. I admit this point is rather technical, and I would not even bring it up to another kind of blogger/writer, but as you take yourself to be doing “rigorous” philosophical analysis, I think it is fair. Some meta-methodological account would be helpful here if much of your critique of Bell is to rest on his poor “methodology.” What do you mean by this? What is your own methodology? What do you think his is? What are the standards by which the two are compared? What are the criteria of adequacy for assessing and adjudicating among accounts? How are these grounded? In your critique, you have assumed some answers to some of these questions without being explicit about it. Indeed, my main objection above is a way of saying that there is something wrong with your assumptions here. That’s a fair response. I misinterpreted your comments here, although to be fair, your phrasing is rather odd: you say, “In fairness to Bell, he may be using ‘orthodox’ to mean a denominational perspective, wherein the wider spectrum of beliefs is what may be considered ‘orthodox. '” I now see what you meant, but the ‘denominational’ thing threw me; I thought you were referring to what a particular denomination would deem as orthodox (for that denomination), which is obviously not what Bell has in mind. My bad. Of course it is, *if that is its goal. * And besides, thus far, you have not shown that any theology in it is incorrect (though you begin that in your analysis of ch. 2, which I’ll get to shortly). See above comments. We should expect this according to his own methodology, not ours. I am not so afraid of emotion as some philosophers have been; I think it has a valid place in rational argument. Nonetheless, my last paragraph was not an argument in the sense that the ones before it were (I hope I would not make such a poor argument as the one you attribute to me); rather, it was a caution from one apologist to another that this particular text has potential for real, positive change, since it contains a beautiful picture of the love of Jesus, which we will both probably agree is all that really matters in the end. I think it would be a shame if someone who needed to see that picture missed it because of some apologists quibbling over methodology online. It seems to me your first point is essentially that Bell isn’t trying to make an argument. I can’t help but think that’s incorrect. His questions are leading, and clearly they are infused with emotion in order to turn readers towards a conclusion. Although he may not state his argument, he is making one nonetheless. Regarding method: my point is not complex. The point is that Bell uses specific “Methods” in making his argument. Whether this means utilizing leading questions to draw readers towards a conclusion; or whether it means simply asserting that something isn’t in the Bible with an unstated conclusion, I find that problematic. I’m not about to get caught up an epistemological debate on method here; my critique is much simpler than you’re trying to make it. You’re complicating this far beyond necessity; I do not feel the need or desire to get into a broad epistemological debate here.